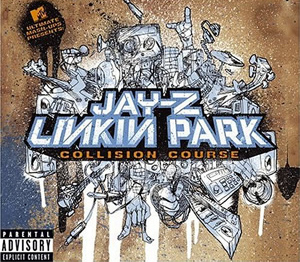 Collision Course is the end result of an MTV special called "Ultimate Mash-Ups" in which MTV contacted Jay-Z asking him to pick a band he'd like to perform a "mash-up" concert with. The premise was to "mash-up" songs from both artists, taking parts from their original songs and blending it seamlessly into singular tracks. The idea stemmed from a New York Radio show in which the host DJ "mashed up" parts of songs from conflicting artists. The idea became an underground hit, and MTV jumped all over it, bringing the trend into the mainstream. Jay-Z picked Linkin Park as his counterpart for the concert, likely based on the popularity of a mash-up named "99 Steps Klosr" that was a smash-hit on New York radio and the internet. The song mashed up Linkin Park's "1stp Klosr" with Jay-Z's "99 Problems". The two were originally only supposed to do the concert together, but Jay heard the rough mixes of the mash-ups that emcee Mike Shinoda had cut in the studio and proposed they make an album. Voila, the first ever official mash-up album released by popular artists. The album would go on to number one on the Billboard Top 200 in its first week, selling 368,000 copies.